Kodak is an iconic photography brand, and if you're above a certain age you'll probably still remember memorable photos being called "Kodak moments". But the shift to digital photography means that it has had to find a new space for itself, and amongst other things, the company now has a line of televisions on sale in the market. Recently, Kodak launched a 55-inch HD smart TV, which has an MRP of Rs. 55,990, but is available at Rs. 39,990. That's not bad on paper, but Kodak next released a 4K UHD LED TV with similar specifications, the Kodak 55UHDXSMART, which is currently being sold for just Rs. 6,000 more, which sounds a lot more attractive on paper. Kodak loaned a unit to Gadgets 360 for a couple of weeks, so that we could test the device and here's what we discovered after using it for a while. The Kodak 55UHDXSMART has rather thick bezels around the panel, with a small Kodak logo centred at the bottom. The remote sensor and buttons are located at the bottom right - this is a little inconvenient as it's highly directional and you actually have to point your remote in that general direction to get it to work. It's a minor issue, but since most people are used to pointing the remote at the centre of the television, this might prove to be a problem. The wall mount is standard, but we used the television with its bundled stand. The "feet" are fairly low, so if you want to use a soundbar with this TV, you'll probably need to find some other place for it. The television itself is fairly thick when you compare it to new UHD TVs from the big name brands, though the weight is nicely distributed. Despite the non-adjustable stand, it was easy to shift the entire unit around without worrying about its stability. Unfortunately, most of the ports on the back of the unit are hard to reach - if you're wall mounting the Kodak 55UHDXSMART, this will be a major headache. You get two HDMI ports, Ethernet, and also composite and component cable hookups at the back, all facing downwards. You'll want to try and get most of these wired up before mounting this TV on a wall. On the left side - which is a lot easier to reach - there's a 3.5mm audio output, two USB ports, an SD card slot, a coaxial TV antenna terminal, and a single HDMI port. The Kodak 55UHDXSMART runs a custom version of Android and overall, the UI is fairly responsive. Don't expect it to jump to life like your phone, or even a set-top box like the Amazon Fire TV or the Apple TV, but by the standards of smart TVs, it powers up pretty quickly, albeit not as fast as some of the more expensive offerings by the likes of LG. It's powered by a 1.4GHz processor with 1GB of RAM and 8GB of storage. All this adds up to give you pretty decent performance most of the time with the likes of video streaming apps, but isn't ideal if you want to play graphics-intensive games. There's Wi-Fi and Ethernet for connectivity, and both are pretty easy to set up. In our case, the router and the television were side by side so we just plugged in a LAN cable to take it online. Once online, simply go to the ATV mode, and you'll have all your smart features available - there is no Google Play store but the TV comes with a third party app-store called Aptoide, which has a good range of applications available including Amazon Prime Video, Spuul, Eros Now, Saavn and Gaana. 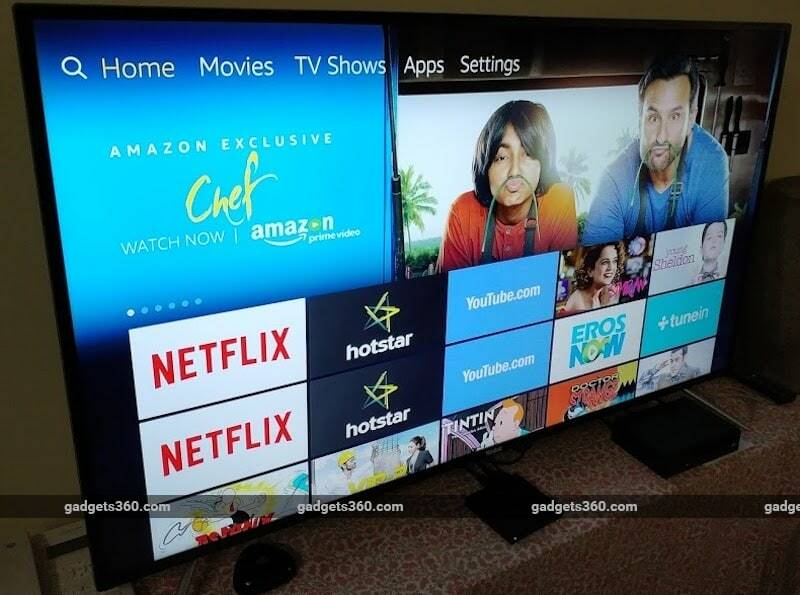 The television comes with a number of apps pre-installed as well, including Facebook, a custom browser, Netflix, Hotstar, and YouTube. Navigation here can be a bit of an issue - you're using the standard TV remote, which makes typing things a painful experience. That said, the streaming apps and the browser all worked fine, there were no issues worth mentioning. 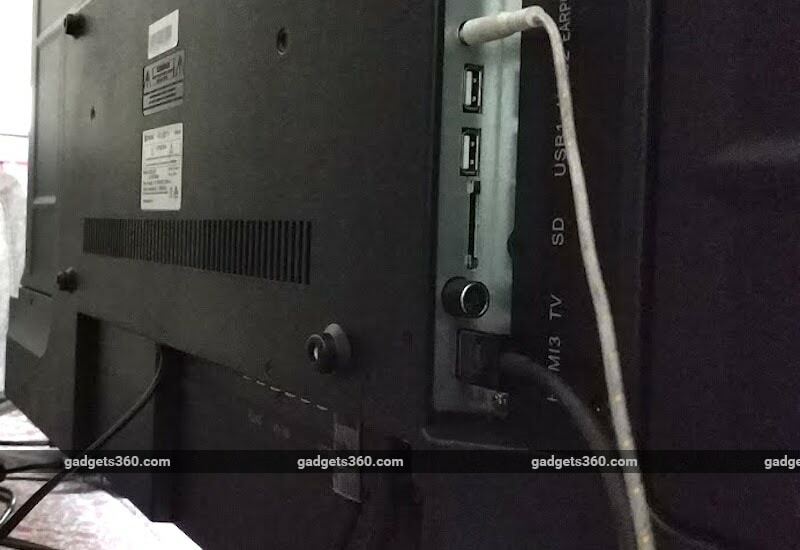 Browsing the Web on your TV this way is perfectly serviceable, but we imagine that it will be more of a curiosity or something you use when you want to show a webpage to a group of people, rather than something you use regularly. 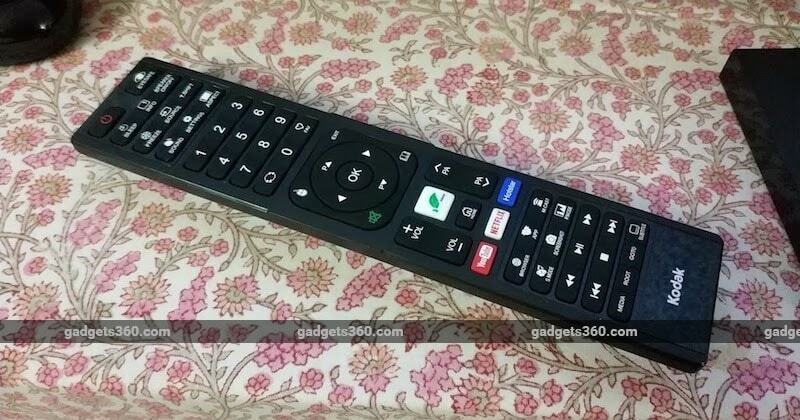 The remote has dedicated buttons to launch YouTube, Netflix, and Hotstar and the experience when using them is smooth and reliable. Once the apps load, you can navigate within them using the TV remote. The remote also has additional buttons for media playback, to browse the contents of an SD card, launch the browser, and even take screenshots. If you want to launch apps other than the three with dedicated buttons, you will first need to switch to the TV mode. Settings and other menus come up as a standard box on the screen that you can navigate using the arrow keys and should be so familiar to anyone who's ever used a television. The TV also supports HDMI-CEC, which allows you to control other devices through the same remote control. This is really handy if you're using something like an Amazon Fire TV, as you can just switch to HDMI and continue using the same remote, which works great. The TV is capable of 4K and HDR playback, so the first thing we tried to do was test how it performed with Netflix streaming at the highest quality options. Watching Stranger Things Season 2, the difference was definitely visible and made a positive impact on the viewing experience. However, the colour range and brightness didn't measure up to what we've seen on some (much more expensive) LG televisions, and blacks don't get as deep as we'd like. In darker scenes on shows like Stranger Things and Daredevil, there were patches of light on the screen which shouldn't have been there, although it did a lot better on bright scenes, where there were no visible artifacts. Skin tones look fine, but if you watch animated shows you might also notice that the colour range is a little muted on this television. You can boost things through the settings to increase colour vibrancy, but that is of course a different thing. The fact is that the Kodak's price range is closer to what you'd pay for a HD TV from a brand like Sony, Samsung, or LG, and when compared to that, it's doing a great job, but take away the price aspect and you can see that it looks a little compressed in terms of the colour range. Brightness is less of an issue, though it falls a little short of LG's Signature OLED line. We had the same experience with some more streamed shows, with and without HDR, and in 4K as well as full-HD. We decided to test the television further with some local content, and played a UHD copy of Batman v Superman playing from a Blu-ray player. As expected, this didn't impact the viewing experience - although the panel has great viewing angles and brightness, the contrast for blacks is not all it could be. On the other hand, the TV has a crisp display that doesn't have any issues of fuzziness or stutter - watching action packed shows and playing video games, there were no issues with motion fluidity. The company claims a refresh rate of 60Hz, and even games like Guitar Hero, where split-second timing is critical, were handled really well. Typical HD content, such as what you get from your DTH set top box, looks good. The upscaling is good enough that nothing looks jagged or blurry, so even if you don't have too much 4K content right now, this TV could be a good pick. In terms of audio, however, the TV is disappointing. There are two 20W speakers which can just about get the job done, but the audio is flat and barely has any range. It's not muffled or distorted or anything like that, but it absolutely lacks character and you'll want to get a set of external speakers or a sounder up and running right away. Kodak's new TV is a little thick, its remote sensor is awkwardly off-centre, and instead of Google Play you're using a third-party app store by default. We've seen better picture quality, but at significantly higher prices. However, it makes up for shortcomings with a full range of apps available, including convenient buttons to launch some of the most popular streaming options right now. The viewing angles of the screen are also great, so you can get a big group together without anyone losing out. And all of this works with an interface that's responsive, at a price that's pretty good. The big brands such as LG, Sony, and Samsung are still largely playing at another level when it comes to pricing, so compared to them, the Kodak sounds like a real steal. However, although Kodak is an established brand, it's relatively new in the TV space. Other brands like Vu and TCL also have 55-inch 4K smart TVs at this price point, which necessitate their own share of compromises. Compared to some of these, Kodak's offering is still tempting, but not necessarily a must-buy. Price: Rs. 70,990 (MRP), available at Rs. 45,999 on Flipkart. product Kodak 55UHDXSMART is a pocket-friendly 55-inch smart TV with 4K and HDR, but is it any good? Read our review to find out.